Solar Dynamics Observatory – STUNNING first images and movies | Watts Up With That? The Atmospheric Imaging Assembly (AIA) views the lower atmosphere of the Sun in ultraviolet wavelengths where we can see hot plasma moving along magnetic field lines. The Helioseismic and Magnetic Imager (HMI) images the Sun in a set of narrow wavelengths which enables us to study motions at the solar surface and collect magnetic field information. WASHINGTON – NASA’s recently launched Solar Dynamics Observatory, or SDO, is returning early images that confirm an unprecedented new capability for scientists to better understand our sun’s dynamic processes. These solar activities affect everything on Earth. SDO will determine how the sun’s magnetic field is generated, structured and converted into violent solar events such as turbulent solar wind, solar flares and coronal mass ejections. These immense clouds of material, when directed toward Earth, can cause large magnetic storms in our planet’s magnetosphere and upper atmosphere. SDO will provide critical data that will improve the ability to predict these space weather events. Space weather has been recognized as a cause of technological problems since the invention of the telegraph in the 19th century. These events produce disturbances in electromagnetic fields on Earth that can induce extreme currents in wires, disrupting power lines and causing widespread blackouts. These solar storms can interfere with communications between ground controllers, satellites and airplane pilots flying near Earth’s poles. Radio noise from the storm also can disrupt cell phone service. The Helioseismic and Magnetic Imager maps solar magnetic fields and looks beneath the sun’s opaque surface. The experiment will decipher the physics of the sun’s activity, taking pictures in several very narrow bands of visible light. Scientists will be able to make ultrasound images of the sun and study active regions in a way similar to watching sand shift in a desert dune. The instrument’s principal investigator is Phil Scherrer of Stanford University. HMI was built by a collaboration of Stanford University and the Lockheed Martin Solar and Astrophysics Laboratory. The Atmospheric Imaging Assembly is a group of four telescopes designed to photograph the sun’s surface and atmosphere. The instrument covers 10 different wavelength bands, or colors, selected to reveal key aspects of solar activity. These types of images will show details never seen before by scientists. The principal investigator is Alan Title of the Lockheed Martin Solar and Astrophysics Laboratory in Palo Alto, Calif., which built the instrument. The Extreme Ultraviolet Variability Experiment measures fluctuations in the sun’s radiant emissions. These emissions have a direct and powerful effect on Earth’s upper atmosphere — heating it, puffing it up, and breaking apart atoms and molecules. Researchers don’t know how fast the sun can vary at many of these wavelengths, so they expect to make discoveries about flare events. The principal investigator is Tom Woods of the Laboratory for Atmospheric and Space Physics at the University of Colorado, Boulder. LASP built the instrument. 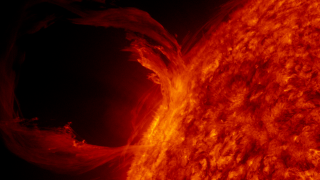 “These amazing images, which show our dynamic sun in a new level of detail, are only the beginning of SDO’s contribution to our understanding of the sun,” said SDO project scientist Dean Pesnell of NASA’s Goddard Space Flight Center in Greenbelt, Md. SDO is the first mission of NASA’s Living with a Star Program, or LWS, and the crown jewel in a fleet of NASA missions that study our sun and space environment. The goal of LWS is to develop the scientific understanding necessary to address those aspects of the connected sun-Earth system that directly affect life and society. Goddard built, operates and manages the SDO spacecraft for NASA’s Science Mission Directorate in Washington. ← Not a joke: Gore's "Inconvenient Youth"
I was so looking foward to full colour detailed views of the next Carrington event…and then I realized, SOB, the internets will be fried, and so will the power grid. Bummer. Things will be so much less fun in a new middle ages with 30x the sustainable population. *** Except climate, which is affected by Range Rovers and cow farts. Wow!! It sure makes one feel small. And the administration wants to slash space funding and take us back to the nostalgic era of trains. It’s quite stunning indeed. Our Mighty Majestic Sol in her full power and glory. Nice. I wonder if when the later images, the ropey ones where the filament is falling back, were being downloaded, a message came up at NASA HQ’s 10metre main display saying ‘internet explorer cannot connect to the internet, please check your connection’. Bloody AOL . Another piece of the puzzle, with great images too. It’s hard to imagine, when looking at the enormity and magnificence of the sun, that it isn’t primarily responsible for all of climatic conditions on earth! Except maybe warming as this is undoubtedly due to trace amounts of C02! I clicked through on the “magnetogram sunspot close-up” to see one of the movies, stunning BTW, and noticed a spinning globe on that page. It shows a northern hemisphere view and, sadly, the north pole is ice free. Well, I am flattered a bit that they chose to present the Ultraviolet frames in a narrowband RGB scheme, but the reds are too weak. Leif, they don’t quite understand how to get the best effects when it comes to color image processing. Seriously, those images and movies are amazing! Six spotless days in a row!, quiet sun is back!. That ofto better understand our sun’s dynamic processes…..Only movements (dynamos) guys? Flintstones’ universe anyone?, come on!, thought that astronomy “a la belle epoque” have passed away long ago! Holy Cats! I was not expecting that. I’ve bookmarked it and dedicated some hard drive space for images. Wow. Talk about fun! You must be a really fun guy to be around. Maybe if you’d get out and do something constructive – like chop some firewood for next winter. For conditions in general but not large climate shifts based on tiny variances of TSI. When you scroll across the Northern Hemisphere images, you’ll notice that the Arctic is ice-free except for Greenland. But when you click on an image, there’s ice all across the Arctic. Leif, they don’t quite understand how to get the best effects when it comes to color image processing. I’ll see what I can do. There’ll be new images every few seconds, so the process will have to be automated. Or perhaps just picking one a day. All activity is caused by weakly conducting plasma [the photosphere is no more conducting than seawater] being pushed across magnetic field lines, generating electric currents, that in turn heats the plasmas and basically cause the explosive events that we see. Better allocate a lot of space. There’ll be 1.5 TerraBytes every day [as much as 500,000 mp3 songs]. The red image of the sun is now my current desktop background. Previously, the desktop had an image of the Sun/Moon in full eclipse. Before that I had Hubble and repair shuttle eclipsing the Yellow disk of the Sun. Can’t help it. The thing boggles the mind. PWL you will have to convince Leif Svaalgaard first LOL (just joking). Folks tempted to use the word “enormity” should check out its meaning in the dictionary beforehand, because it may not mean what you think it does. Hint: it doesn’t mean real big. The small observed changes are like an uncalibrated speedometer – think of the solar irradiance as an analog temperature gauge that hasn’t been calibrated. The small changes in solar irradiance are indicative of larger, unseen, changes in plasma inputs and outputs (all electrical circuits are continuous), gravity and other EM “invisible” EM effects between the Sun, Earth and the solar system. The reason small peturbations in the solar irradiance have so much effect on the climate is because the irradiance is a proxy for the invisible (to the naked eye) fluxes in the EM and plasma states. The error many make is assuming that ALL the energy from the sun arrives at the Earth in the form of radiation. Some of it does, but alot of it, and we have not even begun measuring it, comes via the plasma circuit. And all please realise that magnetic fields are caused by electric currents, there are no such things as magnetic field line reconnections, (these are actually exploding plasma double layers), nor can magnetic fields be “frozen” in plasma. Alfven initially proposed this idea, then after lab experiments, realised that he was wrong. He said so in his Nobel Prize acceptance speech, but unfortunatley the rest of the astronomical community thereafter developed the affliction of cognitive deafness and while they might have listened to Alven address them, they never heard anything. Breathtaking images! One easily loses a sense of scale when viewing these videos. The size of the filament is incredible. Thank heavens for a magnetosphere. Coming soon to an IMAX theater near you. Can they put up a matching satellite spaced a bit apart from the other? That would look great in 3D. Hey, now there’s a great new funding model for NASA! $10 for 15 minutes of live streaming 3D at a big screen theater. I’d go! Professor Mike Lockwood started the investigation after he realised the past two cold British winters had coincided with a particularly quiet period in the Sun’s activity. He was helped in his research by colleagues at Reading University, along with scientists at the Rutherford Appleton Laboratory in Oxfordshire and the Max Planck Institute in Germany. Professor Somi Solanki from the Max Planck Institute said this meant the recent cold weather did not contradict the theory that global warming is being caused by human activity. here are no such things as magnetic field line reconnections, (these are actually exploding plasma double layers), nor can magnetic fields be “frozen” in plasma. Please, not that again. Electric currents are caused by changing magnetic fields through a cross-section of a conductor. Even the current that comes out of your house outlets. I haven’t been a big fan of NASA for quite some time, but I must admit they do do this type of thing very well. If they could be convinced to be just collectors and aggregators of the often important images and data they can provide and to limit their commentary to explaining what it is, without all the sermonizing about what it all means for the global political agenda, I might even be convinced that the billions spent on them is really a worthwhile expense. 21 April: Toronto Sun: Gore backed by group linked to oil industry? The event’s main sponsor is Investors Group, a Power Corp. company owned by the Desmarais family. The Desmarais family and their Belgian partner, Albert Frere, are the largest shareholders in oil company Total, which hopes to take three billion barrels of oil from the Alberta tar sands over the next 30 years. ..
Wow. Look at what we can do! Well I am sorry Leif; but there are not 500,000 MP3 songs to save. But then it would be easy to jot down a computer program to write 500,000 MP3 songs; but who would want to, since there are so many people doing that already, and even more people paying money for them. So the photosphere is no more conducting that sea water; a lot of people would consider sea water to be a short circuit; but then I imagine that photosphere ion densities are kinda low, in earth density terms. Do you know off-hand what sort of electric field strengths are to be found in these parts of the sun; just for order of magnitude reference ? Yes unlike “24” and Crime-Investigation TV shows, in real life pixels matter. stephan (13:59:37) : “Tom in FLA exactly…For conditions in general but not large climate shifts based on tiny variances of TSI. Unfortunately probably means climate long term which includes “AGW” “. No, no AGW of any consequence. How is it that the US produces some, or most of, the best science in the world but also some of the shoddiest work ever published; even from the same agencies? British science is forever damned (or at least for a long time) by our recent ‘investigations’. Great post, as ever, Anthony and co.
Actually we aren’t doing it. The sun is. We are just learning how to watch it without burning our eyeballs out. When was the last time you saw the stars in the night sky while staring into a floodlight? As for the instruments on SDO, this is also why the exposure you use on your digital camera during the day is woefully insufficient to capture stars at night. Electrical transformers work that way – but the input to the transformer is electric current, not magnetic fields. NASA says electric currents cause the solar magnetic fields. An electric field creates electric current – there has to be a voltage drop for current to flow. Dean Pesnell, the chief scientist, said it has already disproved at least one theory, but he didn’t give any details. Does anyone know what theory that might have been? Well I must admit that I’m a bit disappointed. These images are just some of what we had before, but in HDTV format. When will we get to see a greater depth into the solar atmosphere? Like an x-ray, or gamma ray, view? We need more ‘in depth’ viewing, not enhancement of superficial perspectives! This is a ‘voyeurism’ that panders only to the ‘fireworks’ crowd! Now, it doesn’t make sense to talk about an electric field without specifying a reference frame. If you move with velocity v a conductor in a magnetic field B, then the electric field in the frame of the conductor will be of order E = v x B. With v = 100 m/s and B = 0.2 Tesla, E becomes of order 20 Volt/meter. If the conductor is very large [millions of meters], voltage across the conductor will be in the millions of Volt. Such a large voltage cannot be sustained in a reasonably good conductor as a current will flow to short out the field, requiring a continuous movement to maintain the voltage. The current can heat the plasma explosively with the result that the organized movement is disrupted [CME leaving the sun] and the current dissipated. The energy for all this fireworks comes from the movement of the plasma that twists and amplifies the magnetic field storing energy in the magnetic field, increasing the electric field and the current until everything blows up and the pent up energy is expended. This quickly becomes very complicated as the currents also have magnetic fields that can act back on the moving plasma. And where [and how] do you get the electric current that serves as input? The ‘depth of field’ that we are being shown into the sun only shows the magnetic flux. The ‘current’ that gives rise to this ‘magnetic flux’ lays in depths below this ‘depth of field’. Perhaps we would better understand the current that gives rise to the magnetic flux if the transportation of plasma within the inner depths of the sun were better understood. You need a magnetic field to begin with and some circulation of the plasma to provide the power. Well, much as I hate to admit it, this is one government program where I think I got my money’s worth…already. Spectacular stuff. Thanks, Anthony. Look at all that lava! How come theres no ash like in Iceland? Geuss its more like a Hawaian Fire Mountain, pity about those black spots everywhere, spoilin’ the photo. Can’t they shop those out? I don’t get it,… looks like the MET got it wrong again. Sometimes, I just like to appreciate the light and warmth the sun gives us. I guess I’ll leave it to guys like you to figure out the “how”. But it is a marvelous machine!!! !, full of vibrant colors and activity that all can enjoy on various levels!!! Once again I will have to say, there is no diamond that can outshine the Sun and I would rather have a piece of the Sun on my finger than a shiny Earth bound rock. I was just looking at the SOHO photos and was thinking about in 2006, when NASA scientists said we would be at Peak sunspots in 2010… If this is peak… WTF is the next minimum going to be like… ok all joking aside, what is the longest cycle from peak to peak? ie the last cycle Peaked in 2000, with 2013 being 13 years if it takes longer than 2013 for this cycle to peak. What was the longest period between peaks? It’s up and about for the first meteorite shower! Odds it makes it to the end of the year? SETI: Keep the data. We believe you. There is nothing out there! No need for McIntyre to foraging around in your shorts! These SETI folks have NOT been keeping up with the state of science. They clearly have been so focused on their work that they didn’t pay attention to how things are done now. Could someone pass them this brief summary? 1. Decide what the answer is. 2. Discard any data that does not fit the answer. Since the answer has already been decided, any data that doesn’t fit is obviously wrong. 3. If, after the obviously wrong data has all been discarded, there are still some gaps in the answer, you don’t have to get it from SETI data. There’s no trick to this. You just get data from a whole pile of other places and stick it in. Tree rings, philosophy papers, there’s data all over the place you can use. You can even make some up, but you have to have a computer program that randomizes it for you. Just keep on sticking various pieces in until you get what you know is the right answer. 4. Make photo copies of all your work and distribute it to your friends. Each one must cut up their copy and rearrange it in an original pattern, but with the same final answer. Mark each other’s work. Everyone gets an A.
I did this myself and confirmed that the SDO thing is STUNNING. I mean STUNNING! Had to mix some tree rings in, couple of clams, got a ton of data out of a UHI study, but I have it working now. All I gotta do is click and the photos come right up. Can’t reproduce it though, lost the data, so I just keep repeating STUNNING! because I already know that’s the answer. Thier image process is resulting in them looking pale. Whatever is done is automated anyway, so it boils down to how they go about visualizing the individual images. Needs artistic help. Compare them to the STEREO images I have on your site. As you know magnetic field lines do not exist just as isobars do not exist. They are constructs to enable visualisation of magnetic field strength and direction. Dont be sloppy in the same fashion as warmers. The statement also begs the question as to how exactly plasma would move along a level magnetic field rather than from weaker to stronger? Read somewhere that it was in connection with how solar flares form and evolve, but not seen anything explaining which theory. This is absolutely awsome, big respect for the Sun, as always & fantastic pictures. Much in this post tells of what we already know. I’m not knocking, honestly! However, I really do think NASA should go to or employ a different PR company/trainer, or just sack the existing one! “SDO will”, “scientists will”, “the experiment will”…….etc. Should they not show a little more respect & say “hope to”, “should be able to”, “the aim is to”, “the intention it to”, or just “the experiment is designed to”…..etc? The word “will” in this context suggests a definite outcome in a scientific experiment. How are they so convinced by that? I’m all for a positive mental attitude, but this is taking things too far! How many times has an experiment failed to deliver the “will” so forcefully implied by the hype? I fully appreciate this is US tax-dollars here & this is just a press release, but come on. 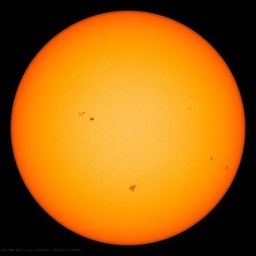 I predict that what we will find out is that we have learned quite a bit more about the Sun & how it “might” be working, & indeed “may” affect our climate, but expectation seems to be very high in this one. To use the current buzzword terminology, unless a “paradigm shift” occurs at NASA (& I for one am sick & tired of hearing the term), this won’t affect the fact that we know very little about element “A”, but know for certain that it has very little effect upon element “B”, & that regardless of whatever that effect is”, it is completely overpowered by element “C”! Now that’s real PNS! OT I had never heard of the expression “paradigm shift” until this century! Is it just little ol me? Wow! I’m officially gobsmacked! This is NASA doing what it does best. They’re on a roll so maybe it’s time they ditched the gremlin plagueing GISS? In a magnetized plasma, field lines acquire ‘existence’ by the virtue of matter being bound to them. It is a very useful construct going far beyond just visualization. ‘Existence’ is a slippery concept. E.g. does ‘time’ exist? ‘Existence’ is a slippery concept. E.g. does ‘time’ exist? That’s a great idea for a You Tube video or TV Special. Just goes to show you that beauty is not only limited to what our eyes can see. Any hopes at this time of being able to detect gravity wave indicators from the new internal visualization capability? Alan the Brit (01:42:17) : OT I had never heard of the expression “paradigm shift” until this century! Is it just little ol me? How would this site with you, Alan? Paradigm shift (or revolutionary science) is the term first used by Thomas Kuhn in his influential book The Structure of Scientific Revolutions (1962) to describe a change in basic assumptions within the ruling theory of science. It is in contrast to his idea of normal science. Yes there is, http://solar-center.stanford.edu/FAQ/Qsolwaves.html . For other readers, ‘gravity waves’ are not the same as the ‘gravitational waves’ predicted by General Relativity. Gravity waves are simply waves in a fluid where the restoring force is gravity [or ‘anti-gravity’ also called buoyancy], e.g. ordinary ocean waves. No, this is invalid speculation. Well time is just a concoction to prevent everything from happening at once; otherwise a totally useless concept ! Now isn’t that wonderful news to hear ? I see JAXA is reporting the largest amount of Arctic Sea Ice extent for this date ever recorded (at JAXA). But it’s probably mostly ice that has turned sour. As a component of SpaceTime, time has a physical meaning. Magnetic field lines are speculation. The fact that matter attaches to them is neither here nor there. water runs down slopes but contour lines, as shown on maps, do not exist. As with man made global warming, claims that 95% of the universe (or evidence) s missing is clear and simple falsification of the theory. Thus to maintain the high ground, references to non existent lines should be amended. That you cannot, but you can with field lines shows that contour lines are indeed just visualization, but field lines are not. Reconnection of field lines is a universal process, and is amply observed in the laboratory, e.g. http://mrx.pppl.gov/ no speculation there. we should stick to what is directly observed and not mix in dislike of modern cosmology. Well it was a Volts per metre figure that I was looking for Leif; just to try and put it into perspective with the sorts of fields that can be found under say a storm cloud in the mid west. put it into perspective with the sorts of fields that can be found under say a storm cloud in the mid west. Which something like 1000 V/m, if I recall correctly. … the sorts of fields that can be found under say a storm cloud in the mid west. “… a “fair weather” electric field due to the positive charge overhead. When this “fair” field is measured by the EFS 1001 field mill, it can be seen to produce an output of from 50 to about 200 Volts per meter (“V/m”). Is a typical example of the [untrue] hype that unfortunately is often used to justify or glorify current [and hopefully, future] research. The theory that the magnetosphere is a ‘interplanetary magnetic field rectifier’ in the sense that there is no interaction for northwards field came out of UCLA in the 1970s, so perhaps the author has been under the influence of local folklore. The rest of us have always known that you can get a response for any direction of the IMF [albeit biggest when southwards]. What is time’s physical composition, though? Look at Figure 14 of http://www.leif.org/research/suipr699.pdf that shows the response [Y axis] for different directions of the IMF [cos a = -1 is southwards, cos a = +1 is northwards, the other curves are intermediate] as a function of the variance, f [fluctuations], of the IMF. When f = 1, the field varies as much as it can. When f = 0, the field is rock steady]. You can see that for f = 0, the response [am] is ten times as large for southwards fields than for northwards fields, while as the fluctuations increase the two curves converge, and at f = +1 [maximal variance], there is no difference or dependence on the direction. The text of the [long] paper explains why. As a component of spacetime, the ‘composition’ is vacuum. The vacuum is teeming with virtual particles, e.g. electrons. All electrons are identical, perhaps because there is only one electron, encoded as a property of the vacuum, and similarly for the other particles. But ‘existence’ is not limited to something that has a ‘composition’. Are we not getting way off topic now? Interesting discussion, had a go at it myself few times in past. This time just a brief comment. Since I disagree with prevailing view of solar scientists regarding the solar currents and magnetic fields, some time ago I assembled for my own use, a logic synthesis of existing ideas leading to an alternative view. SDJ on SC24 has made available Debrecen data which clearly show a longitudinal asymmetry distribution in the solar activity as it can be seen in this polar diagram. I hope SDO may be able to provide an insight in this puzzling phenomenon. I assembled for my own use, a logic synthesis of existing ideas leading to an alternative view. The flaw in your scheme is that Alfven’s polar current changes direction at solar maximum, while sunspots change polarities at solar minimum. Dr. Svalgaard bear in mind this an AC system where flux and the induced emf are 90 degrees out of phase, hence the Alfven’s current and the sunspots polarity are out of phase relationship. Nonsense, as the phase is in time: 5 years. The induced emf does not come 5 years after the flux changes. Apart from that Alfven’s current system doesn’t really exist. There is no ‘polar current’, and the HCS current near the Sun is not radial but azimuthal [as the magnetic field is nearly radial]. AC Flux vs. induced emf phase relationship is one of fundamentals of physics and is defined by period of oscillation, in this case the solar oscillation. Psychiatrist might say: “A denial is the first step towards recovery of despair. Since there is no large-scale current with a 22-year period, there is no AC and no induced emf. Nature denies your ideas, and you deny that they are nonsense. The 22 year cycle of an electric current flow can be only detected by materialization of its physical consequence, the magnetic field cycle of the same duration. The electric current’s 22 year cycle is result of the modulation (loading) by the planetary magnetospheres of the said current, which is so neatly demonstrated by my formula. The alternative you uphold is the reverse: any currents are result of the 22 year magnetic field cycle. That could be a possible alternative if you had a credible hypotheses demonstrating physical existence of an internal source (or cause) of such cycle. There is no scientific consensus on what the so called ‘solar dynamo’ is, or how it functions to produce the 22 year cycle. My hypothesis has all elements necessary for an oscillating system with 22 year period and does not require the ill-defined internal dynamo. The alternative you uphold is the reverse: any currents are result of the 22 year magnetic field cycle. As we have discussed so many times [and still you haven’t learned anything] there are no electric currents creating the solar cycle due to modulations by planetary magnetospheres. The is general agreement that dynamos create the cycles, on the sun, on stars, and even the magnetic field of the Earth. The dynamo is not ‘ill-defined’. That you don’t know how it operates is not a valid argument. SDO [to get back on topic] will likely provide us with the details [internal flows] we need to know to improve the dynamo to the point where it can be useful for prediction. The state of science is sad, indeed. Solar dynamo is indeed ill-defined, since whole plethora of scientists including Svalgaard, Hathaway and many others are unable to positively identify a credible reason for the 22 year cycle. I am not saying I am right and you are wrong, possibly neither is right. is a good aproximation and what physical factors may be at play. Hypotesising with no possesion of a sufficient knowledge is superior to a dismisal for the lack of the same. come back when you have elaborated your ‘hypothesis’ to a similar level. Hypotesising with no possesion of a sufficient knowledge is superior to a dismissal for the lack of the same. If you don’t know anything, everything is possible. Prudent behavior in face of lack of knowledge is not to hypothesize. You have been blinded as was Kepler by an idea. As with Kepler, there is no valid physics behind it, and the approximation is not at all good. Show the result of the formula since 1600. Now, just as with the epicycles, if things don’t fit, postulate another formula for the differences, etc ad infinitum. A classic global warming style oxymoron. Dark matter is directly observed by its gravitational effects, e.g. by gravitational lensing. dark matter, the mythical glue that holds together a fake theory, just as falling temperatures falsify fake global warming ergo we get “climate change”. indirect, supposition and pure invention, not science. Neptune was discovered by observing its direct gravitational effect on Uranus’ obit, but perhaps that was not science, but pure invention, too. to learn why dark matter is generally accepted. It would be far too portentous that I would compare myself to Kepler, but thanks for the compliment. Will read the article, but is the title “Dynamo Models of the Solar Cycle” a first sign of ambiguity, more than one, akin to climate models ? something which we may experience during next two cycles. Interesting question. Just watched Brian Cox’s ‘Whats up with gravity’ on Youtube. I don’t recall any explanation as to what time is other than the word ‘fabric of space/time’. Time could the a construct of our imagination, a way to describe the distance between point A and point B.
a particle? a wave? a Graviton like thing? Does something ‘carry it’. Is it something we could capture and trap? When doing particle calculations, do they have to deduct for the expelling of energy or mass because of expelling of ‘Timetons’? but is the title “Dynamo Models of the Solar Cycle” a first sign of ambiguity, more than one, akin to climate models ? Not ambiguity, but diversity. Depending on boundary conditions, the dynamo(s) can work in different ways. One of the goals of SDO is to narrow down potential candidates. Convenient phase shifts invoked to rescue a flawed idea is a common pseudo-science trick. Time could the a construct of our imagination, a way to describe the distance between point A and point B.
Imagined things do not change with physical condition. Time ‘flows’ differently in a different gravitational field [stronger gravity slows time]. Time ‘flows’ differently at different relative speeds [at the speed of light there is no time]. That is an odd cop out, coming from the most rigorous science surveyor. Not ambiguity, but diversity. Depending on boundary conditions, the CO2 can work in different ways ! Not so, no ambiguity, no diversity in my hypothesis. Remember phase shifts are fundamentals in the physics of reflection, refraction and modulation of waves (cycles). Time could be the a construct of our imagination, a way to describe the distance between point A and point B. A) Is the denotion ‘time’ talking about an actual ‘thing’? B) Is this ‘thing’ a wave, a particle, a timeton,…? No doubt your faith is strong. What is a ‘thing’? Is ‘religion’ a ‘thing’? Does religion exist? What does ‘exist’ mean? In quantum mechanics, ‘things’ may only exist when they are observed. Now, get back to the topic, which is SDO. What is time’s physical composition, though. Likewise, Pluto was discovered because of perturbations in Neptune’s orbit, though later Pluto and Charon hardly had the mass to have done the job. 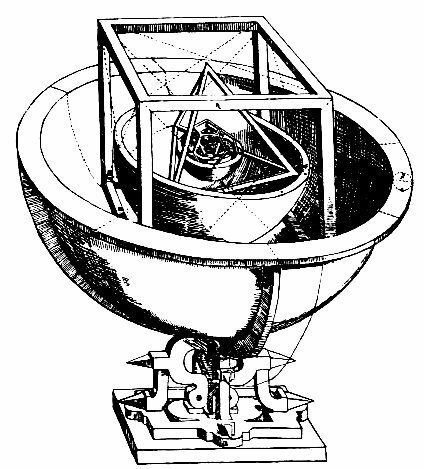 Newtonian calculations hardly predicted Pluto’s jaunty tilt or 3:2 resonance with Neptune. In this sense you have used a selective argument regarding implied gravitational effects. DONALD E. OSTERBROCK, Lick Observatory. Talking about the outer planets, there is also the Uranus’ magnetic anomaly. Despite orientation of its rotation axes, Uranus’ magnetic field is roughly perpendicular to the celestial equator as is for the rest of the (magnetic) planets. One might speculate that this odd phenomenon points to some kind of as yet unknown magnetic linkage between the magnetic bodies of the solar system. This would be just as nonsensical as your other speculations. There are no magnetic linkages. Magnetic fields decrease with the cube of the distance, so unless you have a flow of plasma carrying the frozen-in field around, you don’t get any linkage. The solar wind plasma effectively precludes any other ‘winds’ as they would be swept up and carried outwards. But gravity did not explain the perterbations, nor anything about Pluto at all. And Neptune does not explain entirely Uranus’ residuals, according to some. And of course Pluto/Charon was too small! But they did not know that until after it had been discovered! But gravity did not explain the perterbations, nor very much about Pluto at all. And Neptune does not explain entirely Uranus’ residuals, according to some. And of course it was too small! But they did not know that until after it had been discovered! I did not say or speculate what the linkage might be, so if you speculate it could be the plasma (frozen or not, despite the magnetospheres’ deflections ?) it is fine with me. Any other ideas ? Too bad Pluto got demoted; it would look good there, as it has a similar axial tilt to Uranus. Dr S, in saying this you are writing Percival Lowell and William Pickering out of history. Of course not. They found it because Clyde Tombaugh searched patiently [and great credit to him for that] for decades. Not because of a valid prediction. By contrast, Neptune was found within a few days after the prediction was delivered. If it is not plasma, then there can be no other way. Just like geomagnetic activity would be impossible with solar wind plasma, as Lord Kelvin showed so long ago. The nonsense comes in by assuming that may be magnetic linkage somehow [why not Angels? more people believe in angels influencing things than in magnetic fields]. There can be many explanations. We don’t know yet what to make of it. At times, even the Earth may look that this, e.g. during polarity reversals. But, as before, “if you don’t know anything, everything is possible”. You got money to lose? Go to Las Vegas, instead. Works much more quickly. Just like geomagnetic activity would be impossible withOUT solar wind plasma, as Lord Kelvin showed so long ago. By contrast, Neptune was found within a few days after the prediction was delivered. [upon checking] Actually, the very night after the prediction was received after less than an hour of searching. It took a few more days to confirm that the orbit was correct. That telescope our Kansas farmer Clyde Tombaugh used, and his meager pay, were there because of Lowell’s lifelong passion to find Planet X. Again, he was looking for it based on discrepancies in the orbits of Uranus and Neptune–and they found it. It turned out later to be far too tiny to cause the residuals. So back to the original point: inferring whatever you like because gravitational theory requires it (as is done with dark matter) has not always worked out so well in the past. and, modified Newtonian dynamics (MOND) has been proposed to describe galactic motions. I don’t need Las Vegas, I have NASA. So you don’t think Pluto will have a magnetic field? Okay. I’ll drop ‘Time’ now. This still looks like what it does not what it is. We are not inferring what we like. The data forces the conclusion on us. If our theory of gravitation is correct [which we think it is], then there is no choice in the matter. That is not because of ‘trouble’, but because of the nature of the equations. But does not cover all the other things, and is in any case a wishful attempt to ignore the disliked truth. None of what you quote makes any difference, nor is needed. there are no problems or paradoxes if the theory is applied correctly. I don’t know if there is a difference as far as existence is concerned. Something has to exist both to ‘do’ some thing or to ‘be’ something. One definition of time [that most physicists would accept] is that time is what is measured with a clock. so if two identical clocks can show different time when placed in different environments [e.g. a gravitational field] then their time is just different [and this is an experimental fact, if we like it or not]. Perhaps your problem is that you feel [like Newton] that there has to be a ‘master clock’ somewhere, that somehow shows the ‘real’ time. Except there is no master clock. Your reply brought up a thought. Gravity and/or relative velocity slow down clocks — to the point of almost stopping inside the event horizon of a black hole. If so, couldn’t there be a “maximum possible” clock-rate somewhere in the universe where both velocity and gravity were at an absolute minimum? If so, wouldn’t that be a “master” or “reference” clock, because no other clock anywhere could run faster? So the oscillations in the internal quartz clock inside the satellite has sped up in relation to the quartz clock oscillations on earth occurring in the earth ‘second’. So Time +/- is the by product of the effect of gravity on particles (oscillations in the quartz) but the constant ‘time’ is arbitrary and emergent. Therefore, time is what makes the particle, say, an electron, orbit a nucleus. and, what makes an electron speed up or slow down in it’s orbit of the nucleus is the speeding up and slowing down of time. Time is the force that makes the electron orbit the nucleus! The speed of time is the arbitrary calibration of particle movement measured against another. 🙂 Complete bolox? the universe where both velocity and gravity were at an absolute minimum? Velocity with respect to what? Time is the force that makes the electron orbit the nucleus! The speed of time is the arbitrary calibration of particle movement measured against another. 🙂 Complete bolox? I would say so, but many people believe much nonsense, so you are in good [or at least crowded] company. Leif: Thanks for the input and patience. I’m going to go away and think about this and what you’ve said. BTW-my 10 year old son came home from school, saw your name, and asked me if you were a Viking!? asked me if you were a Viking!? Ha! Love it. I’ll show him. Ah yes magnetic anomalies, southern hemis are in right now I believe. Checked out the pluto images yet? Could we be seeing indicators of internal cylinders? at work here on Pluto? Southern hemi cooler and less brighter? SDO, all cool, except the RGB like Rob mentioned. Thought they had ya Rob, but looks like they need to work on it a bit yet. Two weeks later and the “corrupt” drive is readable. We will keep working on this. Why..
Leif I would argue the opposite. Something has to do something, or be something, in order to exist. I would go further and postulate that something has to do at least two different things in order to exist. If I observe some previously unobserved or at least un-noticed phenomenon; that happens more than once; so I believe I am not seeing Scottish mist; I could announce that I have just discovered a “Thingamebob” which is a new fundamental particle say. Ok so far so good; but I don’t think I can justify calling a subsequent observance of that new phenomenon, as proof that Thingamebobs exist. Proof of its existence must be by detection of some second property of Thingamebobs; otherwise I am just making a circular argument. Well that’s the way I feel about it. After all, neutrinos do have more than one observable property don’t they ? Well that much I do know; one of the exciting things about research in the Radio-Physics Department at the UofA, was the measurment of electric fields under storm clouds. So every time a nice thunderstorm was promised, we would all take off down to the harbor to some remote pier, where we could launch somebody’s new Masters Thesis remote reporting electronic contraption; usually constructed out of surplus radiosonde beacon electronic boxes, and launched under an ordinary equally surplus weather balloon. Now you have to remember that we were too poor to be able to afford Helium down there on the other side of the Pizza, so we had to fill those ballons with ordinary Hydrogen. So we were all playing “dare you to hit me” with Thor, hanging onto that balloon and its payload for long enough to get it inflated and launched into the menacing overhead.. And it also helped to be in close proximity to sea water to ensure a really good ground when the thunderclap we never would hear happened overhead. Somehow, we did survive. So yes I am familiar with the electric fields under clouds. Leif I would argue the opposite. Something has to do something, or be something, in order to exist. ‘be’ and ‘exist’ is circular, and if something doesn’t exist [or ‘is’ not there] then it can’t do something. So yes I am familiar with the electric fields under clouds. And the point was that they are much stronger than electric fields on the sun, because the air is basically an insulator and a plasma is not. Once you create a plasma [lightning] the electric field shorts out. My goal as a retiree (10 years away): Not to have to do one damned thing. Does that mean I will not exist? If it means no more phone calls, or worse, having to make them, I am all for the phrase, “To be or not to be, that is the question”. My goal as a retiree (10 years away): Not to have to do one damned thing. Big difference between having to do something and wanting to do something. Pam: You’ll have to pay taxes so yes you’ll still exist. Let’s do time another time! What a deeply silly thing to say!